When it comes to creating the perfectly roasted pig for your clients, there are two ways to go about it. Firstly there is the Spit Roasting method and secondly there is the Hog Roasting method. Both methods yield the same result – yet each is different in its approach and thus each has a different appeal. 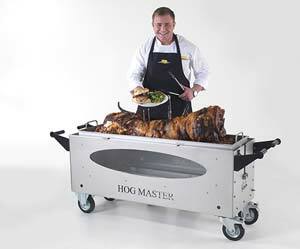 Our hog and spit roasting machines, as well as our combi machines of course (which have the best of both worlds as the machine can acquit itself in both the hog roasting and spit roasting roles), exhibit the very highest levels of functionality, durability and of course ruggedness – and the accessories which go with the machines are no exception. Built using the same high-tech and state of the art design and manufacturing approaches, our Spit Kit accessory is yet another fully stainless steel product package which can be bought separatlely by the customer as an after-market purchase or along with the machine at point of initial purchase. If bought at the time as the machine purchase then the client can expect to make a large saving in terms of price. The Spit Kit accessory package effectively allows a hog roasting machine to become a combi roaster machine. This is achieved by giving the hog roasting machine all the further capabilities of a spit roasting machine too. As with all of our equipment, intelligent design allows the user to easily fit the Spit Kit onto an existing hog roast machine – easy to use is an understatement. Naturally, if you have a spit roasting machine (if so, you may be interested in our Hog Kit) or a combi machine, then this product is not necessary for you – unless you wish to buy a replacement (which is highly unusual due to the sheer durability of these stainless steel products). The Spit Kit is an exceptionally easy piece of kit to use – however, some people get it wrong (which is why we always recommend that if you wish to hire your machine out for use by others, you rent out a hog roasting machine, or you purchase a Hog Kit for your spit roaster and use the Hog Kit instead). Therefore, the following ‘rules of thumb’ are important to adhere to – that way you can be sure of a long lasting accessory that will wow your clients. Firstly, the Spit Roasting Pole (included in the Spit Kit accessory) sits on four bearings when lowered in the cooking position. Once your meat or meats of choice have been roasted to a perfect conclusion, the pole can be raised on the Spit Support Brackets (included) into the serving position. Once up, the Claw (included) secures this in place. Once in the serving position, the Carving Tray (included) is placed underneath the pig, sitting securely onto the machine. Ideally, you will keep a low flame burning in order to heat this carving tray. This tray allows you to carve your chosen spit roasted meat onto it. From here the meat can stay at a perfect serving temperature. Not only does this exceptional on behalf of your clients but it also allows you to serve a huge amount of meat at the right temperature – crucial for the quality caterer. The Motor (included) requires a 240 Volt power supply in order for it to function by rotating the Spit Pole. It is vital in terms of good practice to only attach the Motor to the base of the machine when roasting – if not, simply store the Motor securely in preparation for the next spit roast. To secure the Motor to the machine, simply attach via means of the Motor Bracket (included) – this simple set-up allows the Motor to be attached and detached securely, quickly and safely.Always ensure that the Black Rubber Star or Grommet (included) is positioned between the Motor and the end of the Spit Pole – giving a snug fit that allows efficient operating action. The Motor, once connected to the 240 Volt power source, is operated via the large ON/OFF switch on the side of the Motor Unit itself. Finally, always turn the power off before disconnecting the motor from your Hog Master machine. The Spit Kit is a true triumph for those who may not have enough money to purchase the combi machine outright. 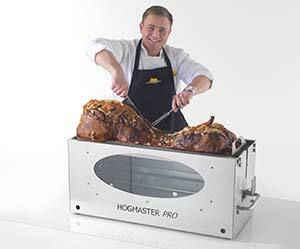 By purchasing the Hog Roast machine, the client can make a large initial saving whilst getting the feel for hog roasting. After a few events and some money in the bank, the Spit Kit is a great way of upgrading with ease – to a method which really stuns the crowd.